Calla lilies add a touch of sophistication at weddings. Their structured form enhances both the brides and bridesmaid dresses to perfection. If you are considering making your own bridal flowers or want to make wedding flowers for friends, family or clients this one day special wedding course will teach you to make: a sophisticated Calla lily buttonhole, a stylized Calla lily corsage, a bride’s or bridesmaid Calla lily posy and an elegant bridal Calla lily spray. The course will cover: the techniques required to construct each design, Conditioning, packaging and storing methods, what to consider when designing bridal flowers, costing and delivery considerations. 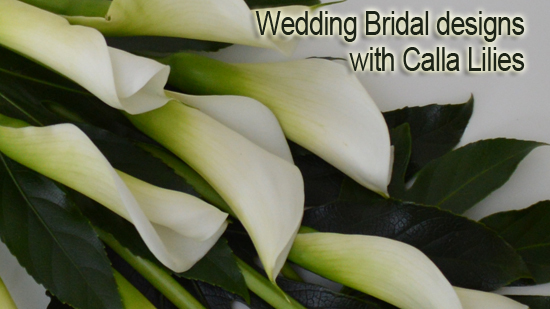 This fun, hands on course will teach you how to add the sophistication of Calla lilies for that special wedding day. Bridal Bouquet wedding designs (Click to visit page) There are a host of different Bridal bouquet styles to suit different dress styles and themes using manufactured mechanics whilst others can be wired or tied.